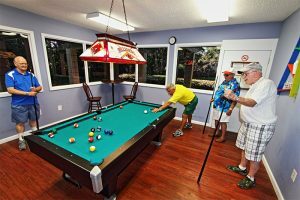 At present, Blair Group owns and operates five active adult communities in Central Florida. A significant number of our residents hail from Illinois – and for good reason! The Florida climate, combined with easy accessibility to beaches on both coasts plus an abundance of activities and attractions, has long made Central FL a magnet for those who wish to spend their retirement years staying active. This 55+ community in Lakeland boasts two 18-hole golf courses, a spacious clubhouse, two pools, lighted tennis and pickleball courts, and more. How many active adult communities in Florida are located on the shores of a nearly 10,000-acre freshwater lake? The community of Lake Griffin Harbor directly abuts the bass-filled waters of glistening Lake Griffin in Leesburg. It has a 55-slip marina, boat launch, vessel storage facility, observation deck, covered outdoor pool, and a spacious lakeside clubhouse full of amenities. Bear Creek in Ormond Beach, FL, sits only a short drive from the Atlantic Ocean. It has three clubhouses, densely wooded nature trails, and a bustling activities calendar that’s chock full of daily events, get-togethers, and outings. There is even a golf course next door! Located on the outskirts of Orlando, Hyde Park offers an attractive combination of peaceful 55+ community living yet also easy access to all the sights, attractions, and infrastructure of a major metro area. Residents of StrawBerry Ridge in Valrico enjoy a plethora of onsite amenities but also the privilege of living next to one of the most thriving parts of the state – the always-interesting Tampa Bay area. For more information and an updated listing of the manufactured homes for sale at our active adult communities in Central FL, contact our Lifestyle Team today! We look forward to helping you reach your retirement lifestyle and home-buying goals.